Never Enough Nails: Lots of Recent Lynnderellas! I'm so behind on blogging! I will be trying to get back on track starting this week, and I'm going to kick it off with a post filled with the latest Lynnderella goodies. First up is Lynnderella Going All the Grey, a beautiful medium grey with aqua holographic nanoglitter and a blue-green shimmer. There aren't a lot of grey shimmers and glitters around, so I like the uniqueness of this one. The blue-green shimmer is pretty prominent in person too, adding an extra bit of interest to the polish. This was two easy coats and just one layer of top coat. It's shimmer and nanoglitter, so it is pretty smooth upon application. The picture below is kind of fuzzy, but I think you can see the blue green shimmer more in that one. Lynnderella Sweater Weather is a deep burgundy shimmer with charcoal holographic microglitter. This is absolutely gorgeous and perfect for fall, winter, and even the holidays. It's a bit vampy and plenty sparkly. Very cozy feeling too! Two easy coats again. It almost could have been one coat, it's quite pigmented. I used one layer of top coat and it was pretty smooth and shiny. The formula was really nice to work with, easy to control. Lynnderella My Lovely Co-Star is described as "multishimmered silver holographic microglitter with brand new never-seen-before silver holographic four-pointed stars. Clear base and scattered small holographic pastel accents". On it's own, it looks like freshly fallen snow, dotted with silver holo stars and little colored lights buried under the snow. Or maybe I'm just ready for snow and winter 😉. 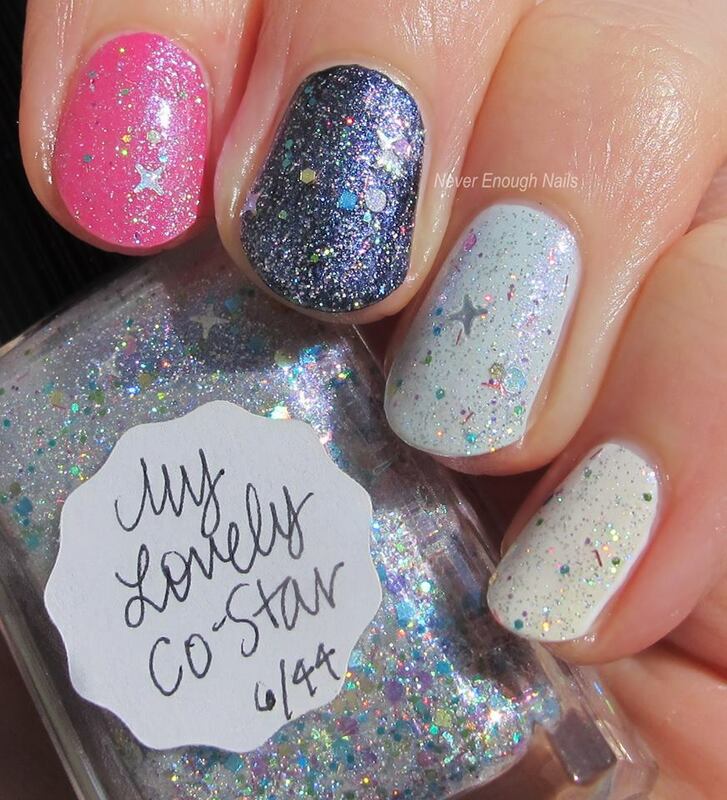 This is three coats of My Love Co-Star alone. I did test it out over some different base colors and you can see that below, but I think I like it best alone. I used one coat of top coat and it was pretty smooth, it probably would be even better with a second layer. Lynnderella Cyanara Spirulina is a stunning holographic blue-green microglitter. This is the most beautiful shade of wintergreen. You all know I'm a sucker for green and this is just one of those stand out colors that I will wear again and again. Two coats and it was lovely to work with! I did use two layers of top coat, as I wanted to really emphasize the shine. Lynnderella describes Forget-Me-Not Violet as "multishimmered rich violet shimmerella with silver holographic nanoglitter accents and violet microflakes in a violet base". The silver glitter lightens up the violet base and gives it a cooler tone, making it look almost closer to a lavender. Hate to sound like a broken record, but 2 coats! No issues to report and I used just one layer of top coat. The last polish in this bunch is Lynnderella Eclair Bleu, a blue shimmer with a hint of violet, holo microglitter and very cool glowing violet iridescent accents. Those violet iridescent pieces really catch your eye in person, especially when the light hits them a certain way. This is three coats. I think the base of this one is a little more sheer on purpose, to let those cool iridescent glitters show. It's nicely smooth with one coat of top coat. Some of the Lynnderellas in this post were only available in The Glitter Fairies Facebook group. Others were listed on eBay. If you are looking for one in particular and can't find it, email lynnderellalacquer@gmail.com to check on availability. If you'd like to join The Glitter Fairies, please send me an email at neverenoughnails@gmail.com so I can help you join!